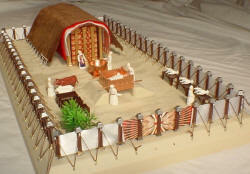 The Bible text about the main Tabernacle tent called the "Tent of Meeting" is Exodus 26:1-36. The main Tabernacle was made of a variety of coverings. Some coverings were linen, wool and leather. 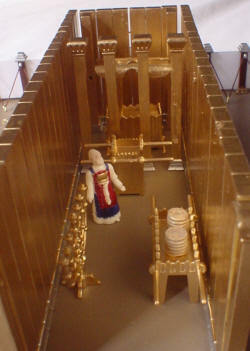 The Tabernacle itself was 10 cubits wide (15 feet) by 30 cubits long (45 feet) but the Tabernacle coverings were 28 cubits (42 feet) wide by 40 cubits (60 feet) long and draped over the sides and back of the tabernacle. The layers were linen, goat hair, ram skins dyed red and a final outer leather cover. We are not sure what the outer layer was. Some translators describe it as manatee leather. Regardless, it is the same leather described as used for making shoes so it must have been a very durable material. Many theologians describe each layer with a religious significance. Often, the red dyed ram's skin is considered to represent the blood of Christ. Our analysis has keyed on the practical aspects. I anticipate that the goat hair layer separating the decorative linen from the red ram's skin served two purposes. It likely kept the red dye of the lambs skin away from the linen and also acted as a kind of moisture wick or air space between the two materials also. The outer layer was the key protection from the weather as it was the most durable material. This is not to say that the layers didn't also have religious symbolic significance but simply that they also had practical purposes also. 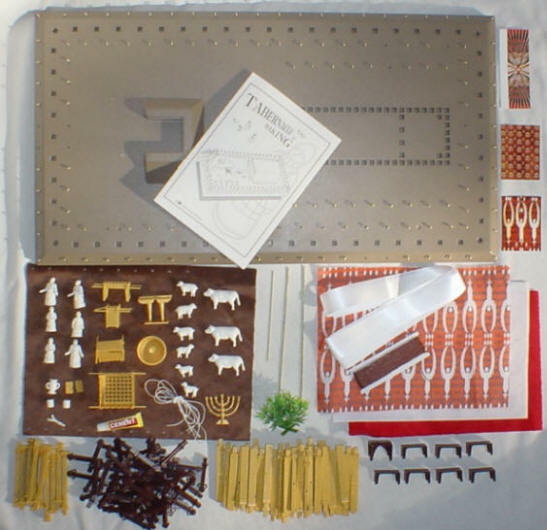 In our examination of the structural aspects of the tabernacle we have determined that the description does seem to have been recorded of an actual structure. These descriptions were not just "made up". A detailed review of them reveals details that show important features that would have been important in making a structurally sound and practical portable facility. Some curtains were joined by loops and others by gold or bronze rings. When you make a physical model you find out that the golden rings fall right above the veil that separated the Holy from the Most Holy place. The Bible doesn't explain that is why they were placed where they were it is just one of those things that you find out when you build the model that is not easily evident from simply examining the text. 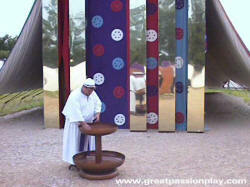 The walls of the main tabernacle were made of gold covered acacia wood planks. Solid gold planks would have been much too heavy to transport. The boards came apart for stacking and transport. 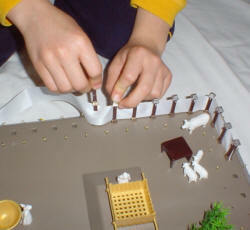 Long gold covered wooden rods went the length of the boards to provide stability. There was a decorative linen curtain at the entrance to the Tabernacle. The decorations were of Cherubim but we don't know what they looked like except that they were winged creatures. 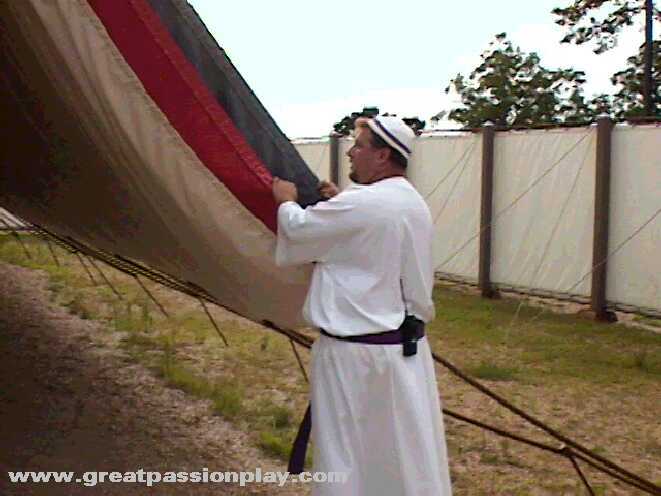 Between the Holy Place and the Most Holy Place was also a similar curtain. Below is a picture of the item as envisioned by the folks at "THE GREAT PASSION PLAY" who built a full scale model of the Tabernacle. This is NOT from our 3D model. You can use this image for comparison to our 3D concept.